I was reluctant to write on this subject since many have written about it exhaustively. I am writing this from a personal perspective which makes it slightly different from what has been written before. 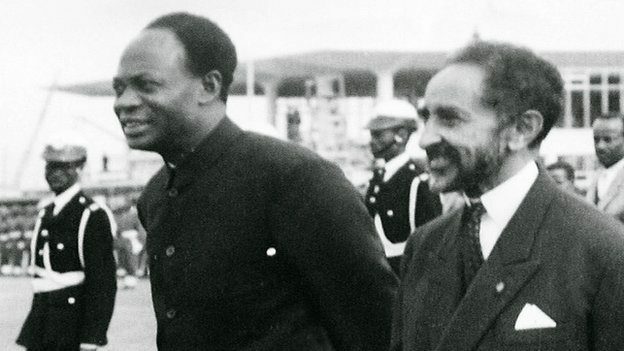 According to Nkrumah the first encounter he had with Ethiopia was while walking the streets of London and seeing the headline of a newspaper “MUSSOLINI INVADES ETHIOPIA. “ In his Autobiography he writes about this moment where he says that he felt that a spear has just pierced his heart. He felt dizzy, sad and dejected. He also doubled his resolve to fight the scrooge of Colonialism which has now encroached the only independent Black Country in the world which has given pride to the entire black race when Menelik the Great scored brilliant victory over the White Race (the same Italians) at the famous battle of Adwa. 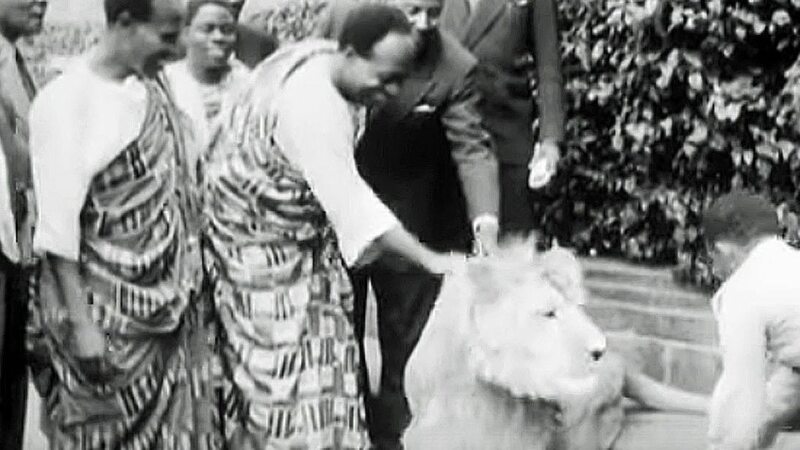 Subsequently the Emperor went into exile in London where he met such Pan African luminaries as George Padmore, Azikiwe, Nkrumah , T. R. Mekonnen (who took his name after Ras Mekonnen, father of the Emperor and Hero of Adwa) Marcus Garvey (with whom he has a falling off) and other Africa and Caribbean leaders. The next encounter is in 1958 a year after the independence of Ghana, an All-African Peoples Conference was organized in Accra. There were only eight independent African states, but 28 countries were represented. It was the biggest gathering of its kind and there were over 300 delegates, prominent among whom was Patrice Lumumba. Ethiopia was represented by Prince Sahle Selassie, the Emperor’s youngest son. 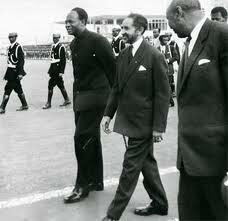 This was also the beginning of the Emperor’s brilliant moves regarding African Unity. Another important thing is for the Emperor to be the first African leader to invite Nkrumah for an Official Visit. On arrival at the airport Nkrumah demanded that a goat be slaughtered and he step on its blood when he came out of the plane. The demanded has been communicated earlier to the Emperor and he has graciously relented even though it was an affront to his religion. Dressed in his magnificent golden robes Nkrumah was a sight to see. An air show at Debre Zeit Air force base was held in his honor and I was fortunate to find a place at the tribune. 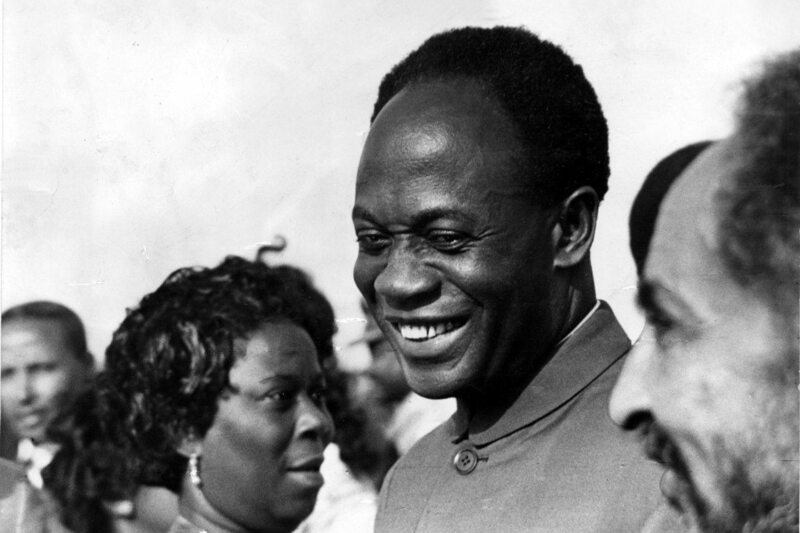 I was sitting at such an angle as to observe the obvious delight of Nkrumah. One hitch was that the protocol put the throne of the Emperor so high that the Emperor was visibly angry when he arrived and saw that. But Nkrumah did not seem to mind perhaps because he thought that it is the right protocol for monarchs (it is said that those who arranged this were relegated from their post soon after.) It was a fabulous air show and the acrobatic of one pilot was remarkable. Nkrumah wanted to meet him. He was presented at the end of the show and I was the one to be surprised. He was my neighbor as well as classmate in elementary school in Tafari Mekonnen Lt. Tigineh. The next encounter with Nkrumah was when he came for the May 1963 OAU Conference. The OAU was opened in the United Nations Economic Commission for Africa (ECA)building which was a gift of Ethiopia to the UN. 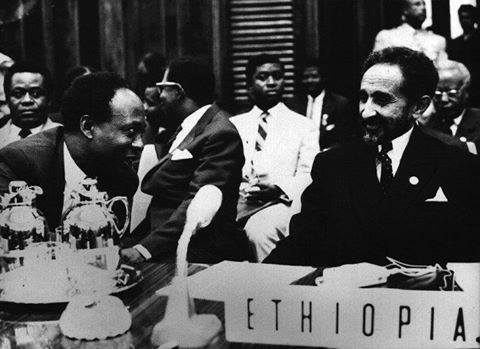 It is also the far-sightedness of the Emperor to bring that important regional organization to Addis Ababa in 1958, which later became a magnet for bringing the Headquarters of the OAU. The main conference hall called the “Africa Hall” had a huge mural of stained glass windows depicting the Past; the Present and the Future of Africa the work of the world famous Ethiopian Artist Maitre Afework Tekle. In the main conference hall was an oil painting of the portrait of the 32 Heads of states and Governments attending. One place was vacant – that of the assassinated leader of Togo, Sylvano Olympus who was assassinated a couple of months before the meeting. Nkrumah was the prime suspect in his assassination (years later, in 1972 I met his son in Hotel D’Ivoire in Abidjan by accident. He was living in exile in Cote d’Ivoire and he firmly believed that Nkrumah had his father assassinated).The assassin was Sergeant Eyadema who ruled Togo for 38 years until his death in 2005 the longest ruling military dictator in Africa. In 1963 I was a third year student in Addis Ababa University College and also in the last year of a 2-year experimental program in journalism. Our American professor was determined that his student attend the conference as journalists. He begged and cajoled the Minister of Information and was finally granted three tickets one of which I was lucky enough to get by lot. It was the most important day of my life up to that point. With my priceless press badge proudly hanging around my neck I literally lived in Africa Hall for three days only returning to my college dorm to sleep. The Press was allowed every access and the meeting was open except for behind the scene negotiations. It is generally agreed that it was President Seku Toure of Guinea who convinced Emperor Haile Selassie to bring the Casablanca and Monrovia group together (I will recount later what he told our delegation years after the event) Ethiopia has no Foreign Minister then but a Minister of State and for all practical purposes the Prime Minister, Tshafi Tezaz Aklilu Habtewold, who used to be a former Foreign Minister and now a de facto Foreign minister was in charge. He had assembled ten or more officials, most with legal background, and they were working on a legal draft drawn up by Chilean and some say Colombian jurist. This draft was supposed to be the framework for the Charter of the OAU. These officials were hovering around the Ethiopian seat at the conference, only two of them I know before as family friends. Most of the rest I met when I joined the Ministry of Foreign Affairs a few years later. If there is one person who was to be picked out of the Ethiopian delegation it should be the Tsehafi Tezaz. However, I think it was a group affair. The Prime Minister was also the only one besides the Emperor who addressed the Heads of States while refuting an accusation by the Somali President. Africa Hall was in a festive mood. Something momentous was in the air. On the second day all the Heads of States and Governments planted a tree each in the small park in front of the ECA. At the evening reception the Emperor had the stroke of brilliance to bring the famous South African singer Maria Makiba to electrify the assembled guests with her music. After the conference we invited her at the University College and she gave a memorable concert. What makes her appearance significant is because Ethiopia together with Liberia had taken South Africa to the International Court of Justice asking it to relinquish administering South West Arica (later Namibia). However, they had lost the case. No other country has fought against Apartheid in its press like Ethiopia. The Ethiopian Herald carried at least one Editorial a week condemning Apartheid which it did for many years. We all know that Ethiopia has given military training to Nelson Mandela. News was filtering that the experts had reconciled the draft Charter and it was rumored also that the Emperor had given an impassioned plea that Africa would be the laughing stoke of the world if the leaders depart without an agreement. The meeting went on and until 3:00AM when it was announced that the Charter was going to be signed. The mood in the hall was electrifying. Everybody including the Emperor looked fresh, even at these wee hours of the morning. Nkrumah looked happy and was writing something and beaming broadly at everybody. Everybody clapped enthusiastically. It was read again and again by the secretariat. That became the slogan of the meeting until the Conference was formally closed. Ethiopian including myself could not be more proud than this moment of historic achievement. Ato Kifle Wedajo became the Provisional Administrative Secretary General of the new Organization of African Unity (OAU) and he essentially established the office from scratch. 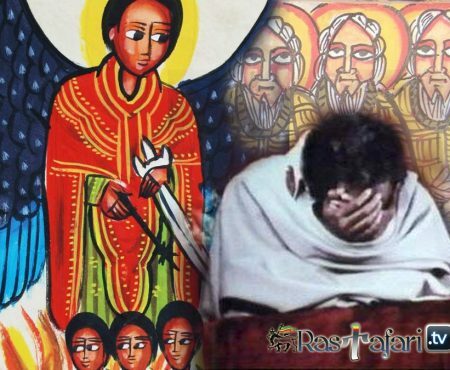 Halfway during the year he was replaced by Dr. Tesfaye Gebre Egzi. The next year the first Secretary General of the OAU. Mr. Diallo Telli was appointed by the Heads of States. It was the logical choice. Now I go forward to 1972 when I was the Deputy Head of Delegation to the 4th African High Command meeting in Conakry, Guinea. Ethiopia was Chairman of the High Command and our leader of delegation was Lt. General Haile Baykedagn. At that time Amilcal Cabral the first president of Guinea-Bissau was assassinated and his brother, Louis Cabral, has taken over with the help of Seku Toure. In order to boost his moral Guinea has asked him to come for a State Visit. Both Lt General Haile and Louis Cabral became honored guests flanking Sekou Toure in all official functions and ceremonies and we likewise were close at hand. At some moment our delegation was transferred to the palace of Nkrumah which Seku Toure has kept as a museum (the circumstance why we went there I will not go into detail here.) Soon after Sekou Toure wanted to see our delegation. He asked if we liked our accommodation, that he was making this exception for us because he loves Emperor Haile Selassie “as a father”. The palace was Nkrumah’s. When Nkrumah was deposed while he was on a State Visit to China, Seku Toure graciously offered him to become Co-President of Guinea. But this did not work so he retired to this magnificent palace built on the edge of a cliff facing the Indian Ocean. In this peaceful seclusion Nkrumah was able to write over 29 books. All his documents were in place while we were there Nkrumah died in Bucharest, Rumania where he had gone to undergo medical treatment. This is what Seku Toure told us about the establishment of the OAU. When the Casablanca and Monrovia group increasingly became separated. “I thought that only Emperor Haile Selassie could bring them together. I flew to meet him in Asmara; I did not even wait until he returned to his capital city Addis Ababa. The Emperor was gracious and agreed to send invitations for African Heads of States to meet in Addis Ababa. I for one promised him that I would convince the Casablanca group (we were few) to attend. Throughout the conference in Addis Ababa I was beside him working for unity final victory was achieved. My love and respect for the Emperor is everlasting.” What he told us is most probably true, more because nothing in writing is found in the files of the Ministry of Foreign Affairs regarding these negotiations. Some of those involved are still alive. I hope any one of them could write about. Since Dialo Telli of Guinea was elected to become the first Secretary General of OAU what Seku Toure said gives added credence. The next day Dialo Telli came to visit us together with his two children, a boy and a girl, who had grown up in Addis Ababa and spoke impeccable Amharic. Diallo was a Minister of Justice then and his two children were with us until we left. They have such a love of Ethiopia which is not even found among Ethiopians of comparable age. I was also glad to meet the incomparable Maria Makeba and her husband the fire brand American revolutionary Kwame Toure (formerly Stocky Carmichael). They were political exiles in Guinea. 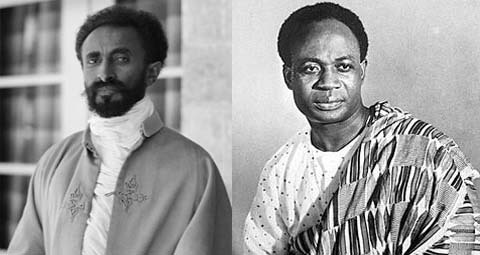 Another final note about how African leaders love and respect Emperor Haile Selassie. The year was 1973 and the OAU Conference of Heads of States and Government was held in Rabat, Morocco and I was a member of the Ethiopia delegation. 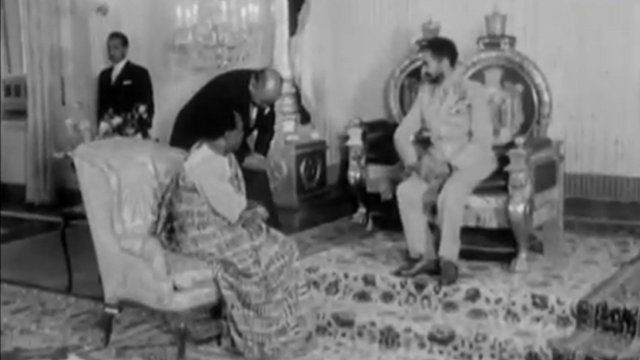 At this meeting Emperor Haile Selassie was nominated unanimously to be called the FATHETR OF AFRICAN UNITY. I have written about this elsewhere and I am not writing about that now. King Hassan of Morocco held a Garden Party partly in honor of the Emperor for his recent elevation and partly for the Heads of States during their weekend. It was in one of the magnificent palaces of the king in the outskirts of Rabat. ONLY FOUR MEMBERS FROM EACH COUNTRY WER INVITED TO THE PALACE. The Emperor and his party have already left and some of us, junior members of the delegation, were at the hotel lobby just talking. Then one of us brought an idea. Why can’t we four pretend to be from an African country and go to the party? We encouraged each other, summoned the delegation car with a flag and four of us (F.T. ; H.W.G., K.B.B. ; and myself) went to the Palace, our limousine flying the Ethiopian flag. We were greeted at the top of the palace stairs by the powerful Interior Minister and Chief of Security, who murmured that we were very late and ushered us in. It was an impeccable garden and the food was sumptuous and exquisite. The others have already finished eating and were congregating on one side of the garden. We could see that the Emperor was the only one sitting and the only one formally attired with his military uniform all the others were in casual attire. After we ate we went closer to the Heads of States to see and listen. The leaders were urging him to take off his jacket which was richly decorated with military ribbons, as it was a hot summer day. He politely demurred. General Gawain mockingly proceeded to help him in taking off his coat. The Emperor gamely resisted. Then King Hassan offered a compromise and said he would loosen the tie of the Emperor and unbutton the top buttons of his shirt. The Emperor relented all the while speaking in impeccable French as well as in English. We were astonished. We have never seen (nor has any Ethiopian ever seen to our knowledge) the Emperor so relaxed, so charming and at the same time so majestic. Some of the leaders were sitting on the grass before his chair. All roared in laughter whenever he spoke. He gamely smiled and was polite and captivating. I think that our curiosity has got the better of us and we inched closer to his chair. Then out of the blue our Foreign Minister Dr. Minasse Haile came and summoned us to follow him. He asked us how dare we came, how we were able to pass security, that we have brought shame to our country. What will Tshafe Tezaz say if he saw us (he was referring to Tefera Work Kdane Wold, the Minister of the Palace) He then told us to go out immediately and we did. There is wisdom, a charm, a fascination and above all unreserved love and respect which other Africans see in the Emperor which has escaped Ethiopians. The love, affection and respect these African leaders showed to the Emperor is a testament to the reverence he enjoys in the rest of Africa. This evil vermin and alley rat is thumbing his nose at us from his comfortable exile in Zimbabwe a fugitive from justice. 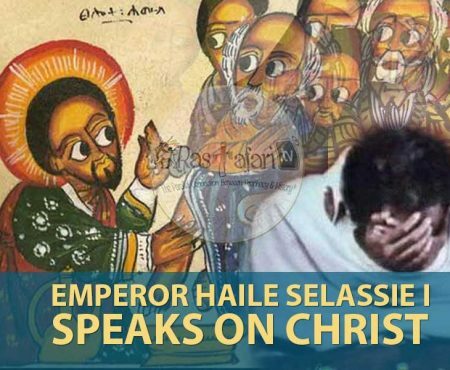 The other little man who drove Mengistu away, the tin pot dictator Meles, has no regard to Emperor Haile Selassie whom he hates vehemently. When this monstrous building of the AU was inaugurated he never mentioned the Emperor. His Deputy Prime Minister was only interested in the nomination one Hodam Amhara for one of the seven vacant posts of Assistant Secretary General. The African Union building is 99.9 meters high signifying the date, and year (September 9, 1999) when the OAU voted to become the AU. Without the presence of the statue of Emperor Haile Selassie we can justifiably call this ugly building the sarcophagus of Africa. It is built by China with 200 million dollars, which African countries could easily afford but did not want to spend. They were not even able to fully utilize their yearly AU budget year after year and could have used that. But they are thoroughly incompetent and inefficient. Most posts in AU are vacant. However, Africans are beggars, led by the beggar par excellence, the leader of Ethiopia. The amount of money these kleptocratic leaders amass from Equatorial Guinea to Ethiopia is known to the Western World who do not even stop them from begging but happily comply by feeding their habit. And hiding their loot. After all they do not expect Africans to behave like themselves and be responsible. Meanwhile, the musical merry go round continues. Africa is dying “a little every day” – a phrase of that giant African Revolutionary, the Algerian leader Ahmed Ben Bella, when he implored African leaders at the OAU conference in 1963, to do so if they want to make themselves free. This African death is the opposite of that. Africa is dying by its blood sucking vermin, its unelected leaders.